Get ready to create cutting edge, scalable IoT solutions that can capture data from anywhere in the world. Our solution is simple and low cost thanks to our direct-to-orbit satellite network, which removes the need for any additional terrestrial infrastructure to get your messages into space and back to Earth. This means you can count on coverage without having to plan, deploy or maintain a network, even for your mobile devices. Patented signal processing smarts allow massive numbers of messages to be sent in an uncoordinated fashion, without the need for complex handshaking and allowing the Myriota Network to scale to billions of devices. This gives you the confidence to scale up knowing that your solution will work today and into the future. Much more than just a modem, the Myriota Module is a sophisticated edge compute device, and has the ability to interface with a huge range of sensors and devices. It can be programmed to log (scheduled or event triggered) preprocess and securely transmit data to suit any number of IoT applications. Of course, the module can also be used as a modem. We’ve done the heavy lifting to accelerate your product development program. You can rely on totally secure data transfer from sensor to cloud that uses AES-GCM-256 with unique per-module keys and the ultimate in security, integrity and authenticated access. Your data is encrypted in flight and at rest, and delivered securely via a RESTful API with JSON for ease of translation at the data endpoint. Your devices are equipped with a secure private identity. Rather than send your device identity in the clear, it is cryptographically protected to prevent unauthorised tracking. This adds another important layer of protection for your commercially sensitive data and operations. The tools you need to add deploy-anywhere capability to your product via Myriota’s direct-to-orbit nano-satellite network are at your fingertips. Our Developer Toolkit provides everything you need to be developing on the service in minutes, and our Developer site is a one-stop-shop for the most up-to-date info. Our software development kit provides easy access to the rich set of features offered by the Myriota Module. The Myriota Module has smart power features that deliver exceptional battery life. It maintains awareness of the Myriota satellite constellation via an orbital model, wakes and transmits only when a satellite is overhead, and it uses intelligent scheduling and specially designed radio waveforms to ensure reliable delivery at minimum power. The Module also exploits the latest advances in ultra-low power IoT electronics. Our extensive lab and field tests give you confidence that your battery will last for years. On the Myriota Network, your device can send multiple small messages using very small amounts of bandwidth. This gives you flexibility and means you are not wasting your battery or paying for more than you need. Myriota’s unique patented technology comes from more than five years of research and development. World-first transmission of IoT data direct to nanosatellite was achieved in 2013 and we have been continuously improving the service since. Our customers have deployed our product and service in the harshest environments on land and at sea, and we’ve reliably delivered massive numbers of messages to them already. Myriota-enabled devices are deployed wherever you need them, on land or sea. Sensor data is recorded and queued for transmission. Right on time, the Myriota Module wakes as the satellite passes overhead, broadcasting queued messages direct-to-orbit within the pass window. An on-board satellite orbit model means that the Module can even wake up in advance of a satellite pass to read a sensor, get its position and be ready for transmission. The satellite receives and stores the transmitted data, forwarding it to a ground station as it passes over. The ground station sends the message directly to the Myriota Cloud. Message data is processed by the Myriota Cloud and immediately distributed to the configured destination. Ready to get started? Follow our Product Makers journey to begin building your Myriota enabled product today. The Myriota Network is a next generation, direct-to-satellite IoT technology platform that offers data transfer at mass scale, at the lowest cost and longest battery life for truly remote applications. To make sure our technology is the right solution for you, learn the important stuff in four easy steps. Give us a call! We love to chat and answer any questions you have about our tech and how it can work for you. Now that you know Myriota is the solution for you, it’s time for the fun stuff. Purchase one of our Developer Toolkits to start prototyping. While you wait for your Toolkit to arrive, browse the technical documentation available on our Developer site, and register an account on the Device Manager. Once your Toolkit has landed, things get serious. Run through the Tutorial and start seeing data transmitted from your Development Board. You are now a fully fledged member of the Myriota Developer Community, congrats! If you don’t have ready access to design and manufacturing resources, we can recommend partners who are familiar with our technology and can help get you to market fast. Okay, now is the time put your big idea into action. Design the software and hardware to suit your full-scale need. If needed, start evaluating options for your end user data analytics and visualisation tool. Once your system is ready, get working on a Proof of Concept (POC) device for field trials. With our help, you’ll legally certify your solution, which includes regulator radio frequency certification and our rigorous testing resources to confirm that your solution is functional, compliant and ready for long-term deployment. Let’s go! This is the really exciting bit. You are now ready for manufacture of your product, incorporating Myriota Modules at the necessary volume. Endpoint registration for Myriota Modules can be handled programmatically to allow bulk deployment. You’re set, it’s time to change the world! 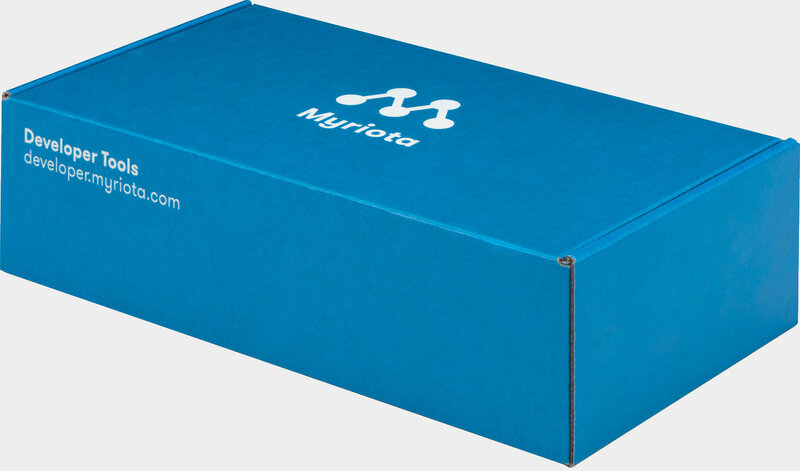 The Myriota Developer Toolkit gives you all the tools you need to add affordable, long battery life remote IoT connectivity to your product. Our unique direct-to-satellite technology offers the lowest cost of data transfer and longest battery life for truly remote applications.